Slow roasted peaches are a superbly simple dessert lathered in a zesty caramel sauce. Place 150g/5½oz of the sugar into a heavy-based pan with the water. 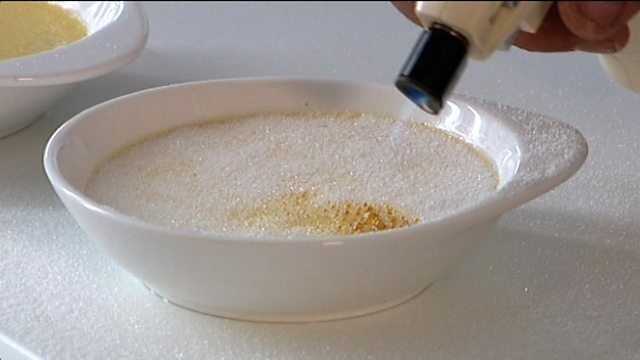 Heat gently until the sugar has completely melted and formed a clear syrup. Turn up the heat and cook for about five minutes, or until the mixture turns a light caramel colour. Remove the pan from the heat and carefully stir in the orange juice - it will splutter. Add the vanilla seeds to the caramel and stir. Set aside and allow to cool and thicken slightly, then stir in the pistachios. Using a mini-blowtorch, blacken the peach skins all over, then peel off the skin by rubbing with a clean cloth. Brush the peaches liberally with the butter using a pastry brush, then sprinkle with the remaining sugar. Place the peaches into a small roasting tin and spoon the caramel over them. Transfer to the oven and roast for about 20 minutes, basting the peaches with the pan juices from time to time. Remove from the oven, add the raspberries and stir, then return to the oven for ten minutes, or until the peaches are softened but still retain their shape. Remove the tin from the oven, cover loosely with foil and leave to cool - this helps the juices to gather in the bottom of the tin. To serve, place the peaches and raspberries onto serving plates and drizzle over the caramel sauce from the roasting tin.